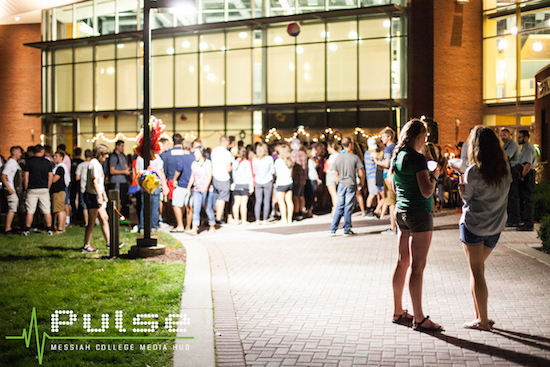 First-year students get a chance to talk and dance outside of Larsen Student Union at last year’s block party. This year’s welcome week campus block party will be on Friday, August 28th from 9-11 p.m. for first-year students. While the block party is always a much-anticipated event, this year SAB, Eyas, and the Pulse are teaming up to create a memorable experience for new students. The block party festivities will span three locations on campus. At the LOFT, students can climb the bouldering wall, try slack-lining, play games, or unwind in a relaxed atmosphere. The second location, The Rafiki House, will offer a mix of international music, dance, games, and food. SAB, the Pulse, and Eyas will host their portion of the party outside of Larsen Student Union. This area will feature a glow-in-the dark theme as well as dancing, a photo booth, lawn games, and lots of freebies. This is the first year SAB, Eyas, and the Pulse have collaborated on the block party. The three organizations are pulling their resources to create a fun experience for first-year students. “I am really excited because we typically run this section of the block party on our own but this year we’re going to be combining with the Pulse and Eyas. There will be a student DJ, dancing, free food, and a glow-in-the-dark theme and decorations. It’s going to be a really great time,” says SAB President Sara Bretz. The Pulse’s Student Director, Ally Coonradt, is also looking forward to the event. “The most exciting thing about this is that it’s never been done before. We’ve enjoyed working together to create an experience for incoming students that’s brand new,” says Coonradt. Bretz adds that while the three organizations are still trying to nail down details, she’s hoping to get glow-in-the-dark bracelets, lanyards, volleyball, lawn games, and black lights. “There will definitely be a good portion of glow-in-the-dark themes,” she says. The theme isn’t the only thing first-year students have to look forward to. Besides dancing and music, there will be many free items offered and a chance to be a live-studio guest on 90.7 Pulse FM. Coonradt says the freebies will include candy and Italian ice as well as extra giveaways at the three tables for each organization. Eyas chair, Alex Morgan, says the Eyas table will be filled with giveaways and information. “First-year students can expect free Eyas gear, a list of the can’t miss campus events hosted by Eyas, and a chance to meet a bunch of Eyas members,” she says. First-year students will not only meet this year’s Eyas, Pulse, and SAB staff members at the block party, but also get a chance to interact with each other. “It’s unstructured time to hang out and be comfortable with each other. This will be a good way for people who are tired of the small talk and just want to have some fun,” says Bretz. This year’s incoming students will be the first to experience the new block party collaboration. To join the fun, stop outside the Union on Friday, August 28th for music, dancing, freebies, and a great time.